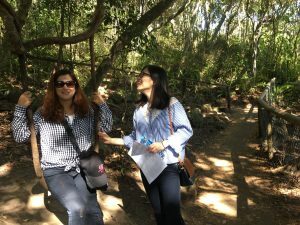 Explore the Gold Coast while making new friends, having fun and speaking English. 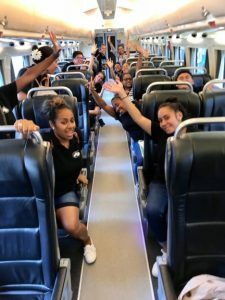 The Gold Coast landscape is famous for its beautiful beaches, sub-tropical rainforests, waterfalls, fresh water rivers, mountains, and the urban city is known for it's exciting nightlife, theme parks and endless choice of eateries. 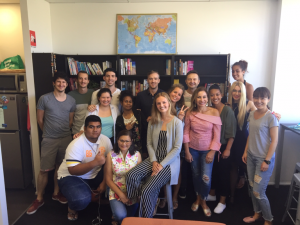 Here at The Language Academy, we organise an activity every week for students to encourage a healthy social life and immersion into the Australian way of life. Food, conversation, and great company. Our campus is known for being a multicultural hub because of the eight different languages we teach. Students and teachers often bring in national dishes to share, and we always love to celebrate a date of cultural importance such as Chinese New Year and Brazil’s Carnival. This activity is free of charge, unless you would like to bring a dish to share. Have you always dreamed of cuddling a koala? Or feeding a kangaroo? 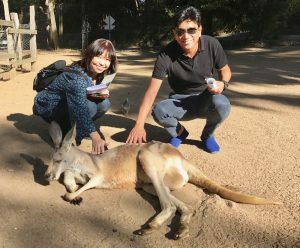 Get up close and personal with Australia’s native animals, learn about Aboriginal culture and explore the beautiful grounds at Currumbin Wildlife Sanctuary. Please note that this activity requires an admission fee. Contact us for bookings and enquires. Take a short walk from The Language Academy to an area in Mermaid Beach known for its creativity and laid-back vibes. 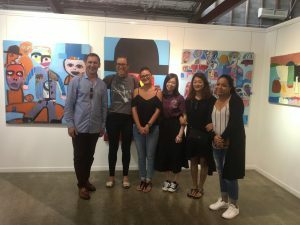 Teachers and students can peruse the local and international works of art and explore the concepts behind the artworks to gain a deeper understanding. This activity is free of charge, unless you would like to take the bus. Visit some of our local national parks where kangaroos, wallabies and koalas call home. Walk through the beautiful trees and parkland to de-stress and re-energise for the week ahead. 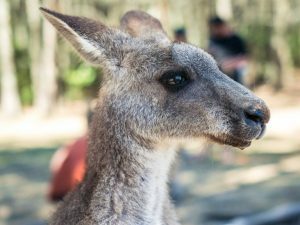 We especially like the Coombabah lakelands Conservation Area because of the high population of kangaroos = a better change of seeing one. This activity is free of charge, however you will need to pay for a return bus fare. Burleigh Heads is one of the most beautiful locations on the Gold Coast. It has plenty of healthy and alternative food and shopping choices, and amazing views from the top of Burleigh Hill. As you walk through the rainforest to the top of the hill, you will hear native birds, see bush turkeys and if you’re lucky, a water dragon. This activity is free of charge, however you will need to pay for a return bus fare, some lunch if you get hungry, or want to go shopping down the main street. 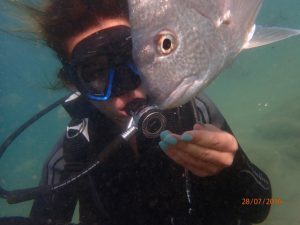 Go scuba diving in the beautiful Australian ocean with a qualified scuba diving instructor. No prior diving experience is needed to explore underwater. Please note that you must be able to swim, and have an intermediate or higher level of English understanding to participate in this activity. Please also note that this activity has a booking fee. 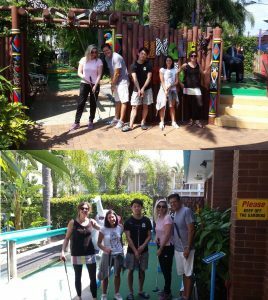 Take a short walk from The Language Academy to the Mermaid Beach Putt Putt and get ready for some fun! There are three themed 18 hole courses: Jungle Trail, Fun Run and Waterways. Whether you are new to the idea of mini golf, or have played before, this is a great way to get to know other students and have a laugh at the many obstacles on the courses. We take regular road trips to places such as Byron Bay and Brisbane. Byron Bay is known for its relaxed atmosphere and beautiful landscape. Brisbane provides all of the city comforts one would expect with endless choices of eateries and shopping. This activity is free of charge, however, food is not included if you would like to buy lunch or go shopping.